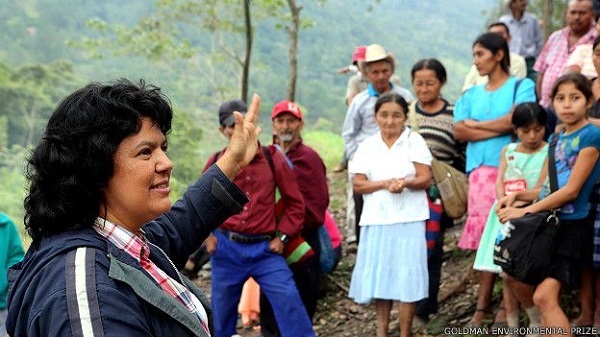 Yesterday the world woke to the terrible news that Berta Cáceres, world-renowned Honduran indigenous activist and mother of four, was murdered in her home in La Esperanza, Intibuca, Honduras. It was a shock to many who knew and worked with her. Cáceres was a founder of the Civic Council of Grassroots and Indigenous Organizations of Honduras (COPINH), a powerful coalition active in various struggles around Honduras. In 2015, she won the prestigious Goldman Environmental Prize for her part in organizing resistance to the Agua Zarca Hydro-Dam that threatened the environment and indigenous ways of life in Honduras’ Rio Blanco community. “Berta was a force rooted in the past and imagining a different, decolonized future, free of the three systemic forces she routinely identified as her true enemies. Capitalism, racism and patriarchy,” freelance journalist and friend of Cáceres, Jesse Freeston, told Upside Down World. But beneath the sadness of loss is an all-too-familiar fury. Cáceres’ death was political murder. It was a premeditated, probably paid-for, assassination, carried out in the middle of the night. It was the ultimate retribution for her dedication to an on-going struggle for justice in Honduras. Officials said Cáceres was killed in the course of a regular robbery. But in a country notorious for political assassinations committed with impunity, few really believe the police report. Even if by some twisted, morbidly-ironic coincidence Cáceres was killed as thieves broke into her home, they only just beat the assassins through the door. It wasn’t as though the assassins weren’t coming soon. For years Cáceres had been the subject of persecution and death threats for her work with the Rio Blanco indigenous community to block a major hydroelectric dam project which was initiated without any input from the local indigenous community. She has been detained and unjustly accused of illegal activities. A secret ‘kill list’ targeting activists, journalists, and politicians was leaked to the press on Nov. 23, 2013 listing Cáceres as the number one target. Her murder took place despite a recent ruling by Inter-American Commission on Human Rights granting Cáceres special security measures. According to an early AFP report officials denied that there was a failure on the part of security personnel the day of the murder. The Tico Times reported, “The security minister said Cáceres had spent the night away from the home that was registered with the authorities. Fellow activists said she had moved to a safe house fearing for her life.” Recently, Cáceres was involved in what she deemed a “big altercation” with representatives of a hydroelectric company. Beverly Bell, founder of Other Worlds, a collaborative women’s movement that worked with Cáceres, told Upside Down World that there is no doubt that Cáceres the murder was politically motivated. 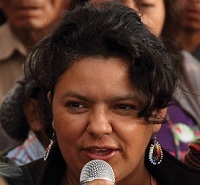 “[Cáceres] is one of the biggest threats to the government because she is as the head of a movement that is trying to project indigenous land and waters from multinational investment with the backing of the United States government. It’s absolutely political,” Bell said in an interview. There was at least one witness to Cáceres’ murder. Gustavo Castro Soto, member of Otros Mundos Chiapas/Friends of the Earth-Mexico, was visiting Cáceres as part of a peacekeeping delegation that night. He was injured during the attack. Castro went to the local court on the morning of March 3 with a lawyer from COPINH and a representative from the Mexican Embassy to report Cáceres assassination. As of the time of writing, he has not left the local court. Fearing detention or persecution, international supporters issued an urgent statement late on March 3, calling for Castro’s protection and his safe return to Mexico. International solidarity activists have taken to social media, calling for a swift investigation and justice for Cáceres and her family. The U.S. Ambassador to Honduras, James D. Nealon, tweeted on March 3, condemning the murder and offering “US government resources” to bring the criminals responsible to justice. Unfortunately, Cáceres’ case is only unique because of the amount of international attention it has received. In Honduras, extreme violence and extrajudicial killings are routine, and often carried out with impunity by private security forces or even military and police. Multinational corporations have been accused of hiring thugs to violently push their agendas onto communities that resist them. According to a 2015 Global Witness report, Honduras is the most dangerous country in the world to be an environmental activist. One hundred and one environmental or indigenous activists were killed in Honduras between 2010 and 2014. More than 10,000 complaints about human rights abuses have been filed with the Honduran police since 2009. The Inter American Human Rights Court visited Honduras in 2014 and determined that the impunity rate in the case of human rights trials was as high as 98 percent. 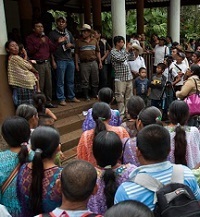 The violence and impunity against indigenous activists like Cáceres cannot be fully understood outside of the context of the 2009 military coup, which paved the way for multinational interests and free market policies to be implemented at any cost in Honduras. Since the coup, the Honduran oligarchy has successfully put two hyper-conservative presidents into power through blatant election fraud, intimidation, and violence. These governments allow corporate death squads, along with the state military and police, to roam the country attempting to terrorize people into complacency with neoliberal projects like mines, dams and mega-agriculture. When Cáceres went up against the dam at Rio Blanco, she plucked at a strand of this web of international interests. The recoil would eventually kill her. 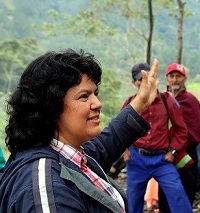 “As an indigenous woman who was a keeper of the water, defending her community against destructive dams and mining projects, [Cáceres] became a target for assassination by powerful economic and political interests who have militarized social conflicts all across Honduras, El Salvador, Guatemala and Mexico,” explained Al Gedicks, environmental sociologist and expert in indigenous resistance to the extractive industry. The United States government, according to Gedicks, also bears some blame in Cáceres’ death, in its complacency with the 2009 coup and its continued military funding despite reports of human rights abuses. Under the guise of its “War on Drugs” the United States government spends millions supporting the Honduran military. In 2015 the State Department requested $44.7 million for developmental assistance, much of which goes to military projects, and an additional $3.1 million for foreign military financing. With this money, the U.S. trains and equips the Honduran military. The U.S. government only nominally withdrew funding from Honduras after the coup. It has supported the subsequent Honduran governments claiming all elections since 2009 have been democratic, despite compelling evidence to the contrary. Ultimately, the U.S. government supports the economic agenda promoted by the post-coup governments as they are in line with regional free trade agreements and privatization policies. It generally turns a blind eye to the violence and corruption. Although it could have been anyone, Bell pointed to the Honduran military as possibly responsible for Caceres’ murder. If that were the case, U.S. tax dollars may have paid for the training of her killers. With time and sufficient international pressure for answers, perhaps Cáceres’ family will someday know for sure. Cristalyne Bell contributed to this report. Sarah Blaskey is a freelance journalist stationed in Costa Rica. She has worked throughout Central America covering social movements, corporate policy, and elections. Her previous coverage of Honduras can be seen at TruthOut, AlterNet, the Tico Times and Dollars&Sense Magazine.